Here's an amazing Viking themed fantasy adventure online casino slots game form the developers at Microgaming. Join & spin today! Microgaming: the record breaking game developers are here and in full swing, ready to give players the types of online experiences you never forget. With titles such as Mega Moolah, Lotsaloot and Major Millions under their belt, it’s plain to see how they have managed to create such a reputation for themselves as one of the go too developers for winning rolls. You can discover more about Microgaming's range of online games here at Easyslots.com. With a title like Thunderstruck you’d expect something to do with the weather right? Well you’d be a hundred % correct if you did! This title is a throwback to the days of old where slots could live off the merit of very simple concepts that play to the best common denominator. 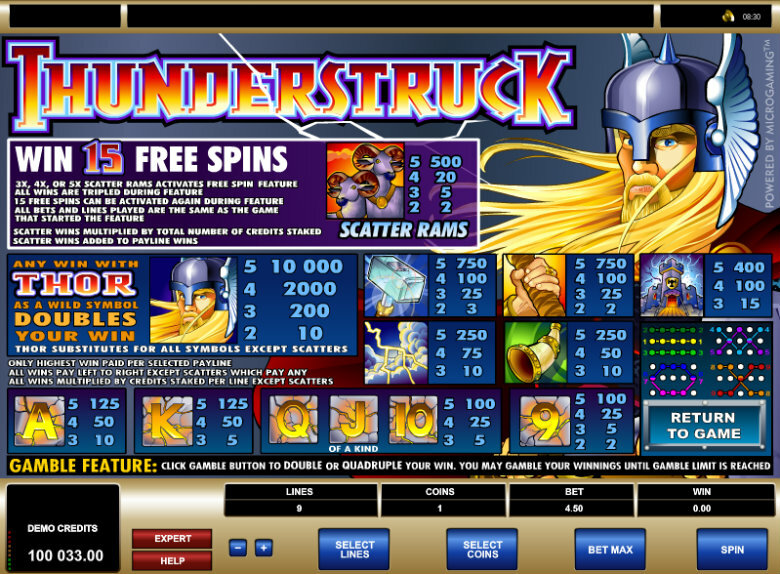 This is an online slot that is based on the god of thunder himself: Thor. Although never mentioned by name (copyright issue) he is very clearly depicted throughout the game. 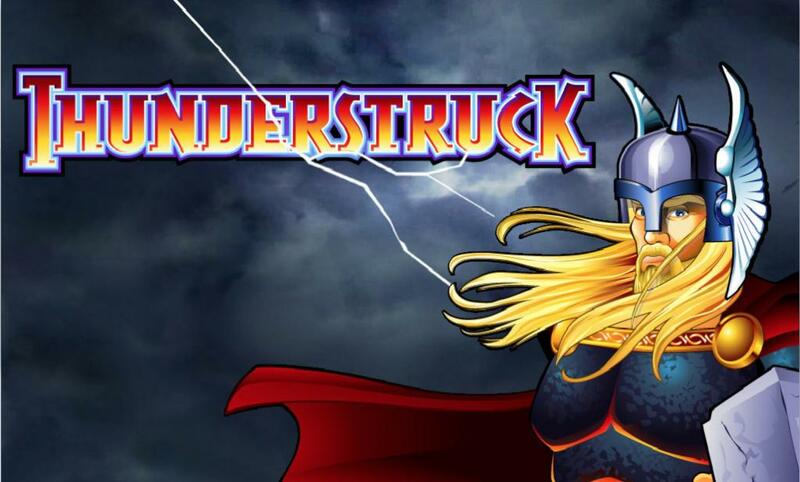 Thunderstruck is an online slot that even the god of thunder himself would be proud of and that’s a guarantee. 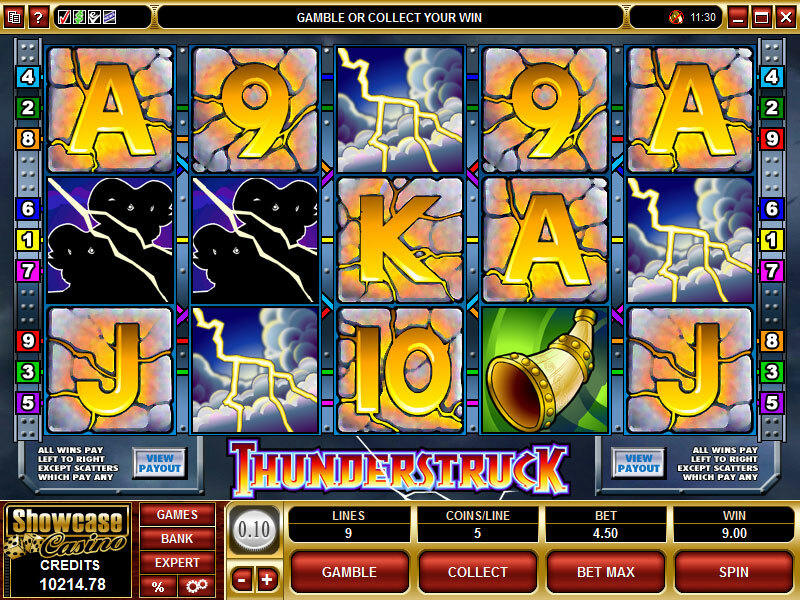 Thunderstruck is a slot that comes with 9 pay-lines, 3 rows and 5 reels, so as you can see there are many different ways for players to manipulate the weather itself to fit their own ill. Make no mistake about it, there are some godly prizes, you need only gain the favour of Thor himself by traversing his reels. Like many other online slots in the market you will find all of the regular offenders. Wilds, scatters, free games and a variety of different bonus features will all ride the lightening with players, just remember to get off at your stop, otherwise known as money. 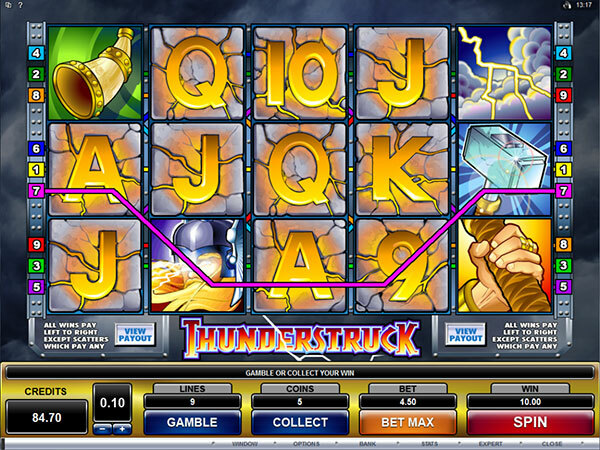 There are many different symbols in this online slot that all play towards the theme of the slot in general, expect Thor himself to make an appearance as he just so happens to be Thunderstrucks wild symbol. Like many wilds in the online gaming stratosphere, the wild will substitute for all symbols except for the scatters which opens up even more avenue for victory. You can also increase your winnings by playing other bonus features that all create different perspectives on just how to play. Other symbols in this title seem to appear across the reels taking the shape of many different items related to Thor. You’ll see from first sight that this is a rather pretty slot, a great accomplishment from the guys over there at Microgaming. You should have known straight away that this was going to be a great Easy Slot when this dev team is at the helm. The god of thunder is always looking for new challengers to take on the mantel of the god of thunder, although seeing as that is his title instead you’ll be the god of slots: a title you’ll have to earn through hard work and dedication. Like everything in life there is nothing ventured from nothing gained, so in other words you need to break your comfort zone in order to succeed. Thunderstruck is a slot done right, play now to see for yourself. If you enjoyed Thunderstruck you might also like Sugar Train Slots Game.